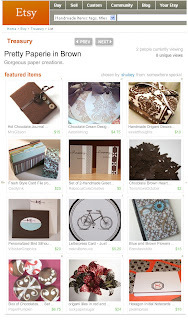 Whisker Graphics: Featured in a Treasury!! Stacey over at Shubey created a VERY lovely treasury on etsy and was kind enough to include my Bird Silhouette flat notes (they are the 3rd photo down on the left). I think she put together a pretty palette and made great choices. I'm always amazed at the talented people who play/work on etsy. I'm liking those magnets on the bottom left! Thanks Stacey! BTW: LMK if you're interested in this: http://twowritingteachers.wordpress.com/2009/01/22/busy-adults-sometimes-need-incentives-to-write/. Would love to have you on-board.